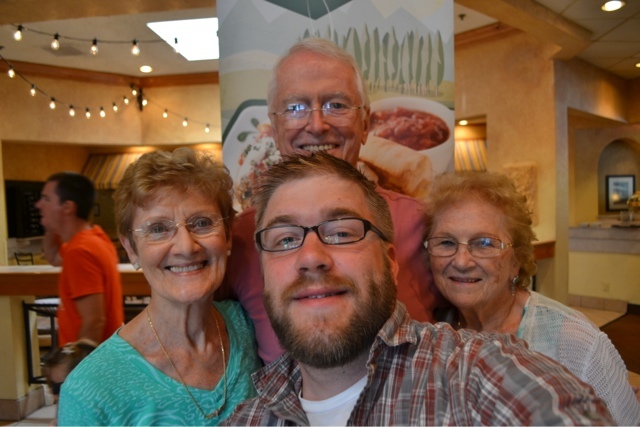 Part of this summer was to delve a bit into my Nease family history. The Nease family has been in the CotN from the beginning, with the transfer of my great-great grandfather Rev. 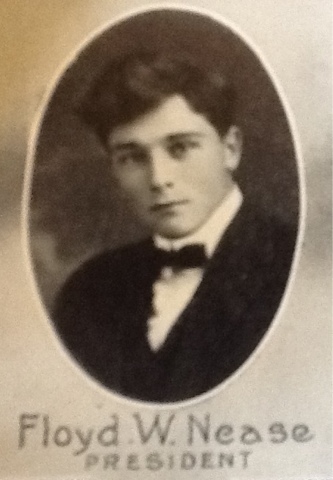 William Oscar Nease in the young holiness denomination. Two of his children (Floyd & Orval) went on to pastor and administrate in the struggling but growing world of Nazarene higher education. Today, the United States has ten college/university/seminary locations in the United States. 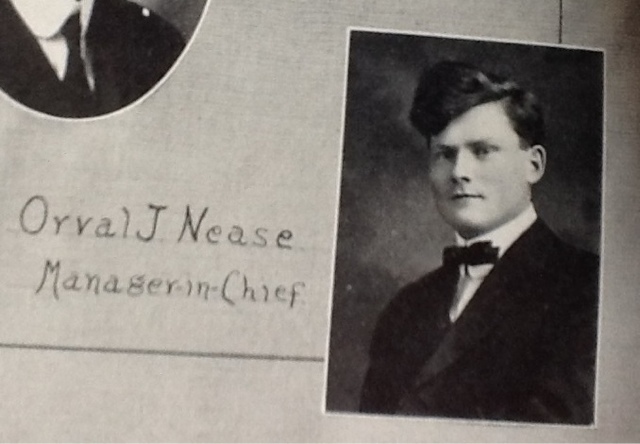 Someone in the Nease family has served as president of half of them at one point or another. Many others in the family have taught or served them in some other ways (President of alumni associations, professors, and so on). Dozens more have been students. In the past, more people cared about such things. Today, I care as these are part of my family history and in great part, the formation of who I am. So I visited both with people and in places that somehow spoke to the Neases who walked before me. This morning, as I reflected with a mentor, I acknowledged that I can be a rather sentimental person. Thinking that someone has walked in the same place that I am visiting is meaningful to me. I can't explain why. And so I visited places that would otherwise bore most anyone else while on the West Coast portion of this trip. 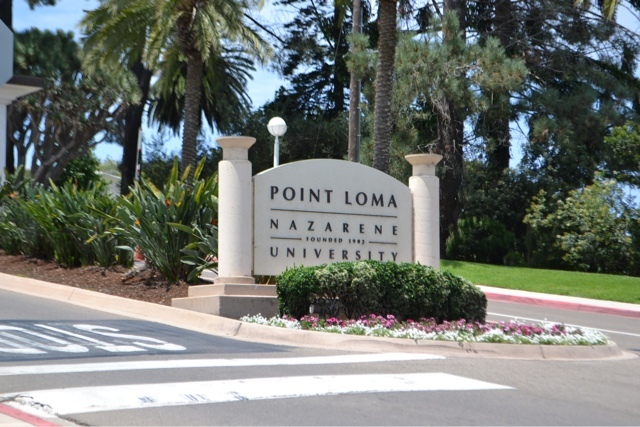 After breakfast on Monday (July 22), Dr. Mary Paul directed me to Point Loma Nazarene University's campus and showed me a few buildings/sites that I was interested in. 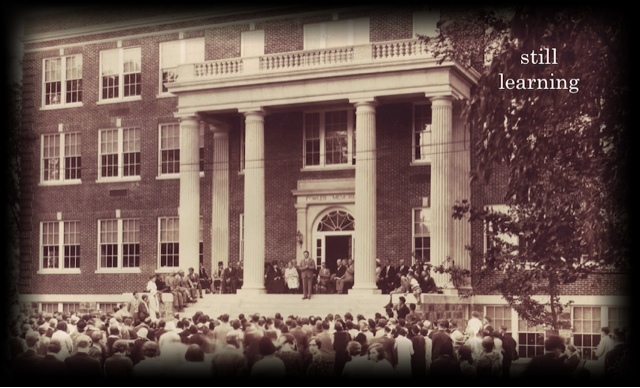 I had been here twice before when representing ENC as student body president for two years. For some *unknown* reason, the SBPs of each Nazarene institution get together for meetings every year in the same place: PLNU in San Diego. In January. Go figure. But my previous visits had me with slightly less-interested eyes toward plaques and buildings and such. This visit to PLNU was different. 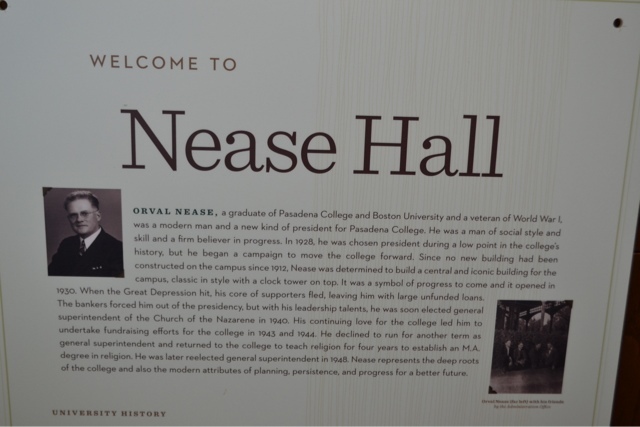 So on Monday morning, I spent some time walking around Nease Hall, named after my great grandfather's brother (is that my great-great uncle? ), Orval J. Nease. 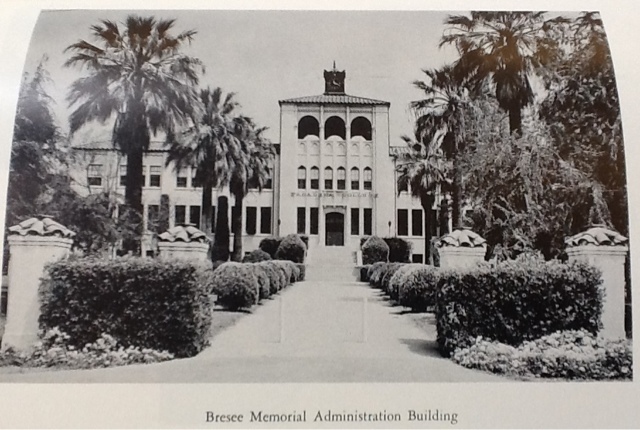 He was president of then Pasadena Nazarene College, which later moved to Point Loma and became PLNU. 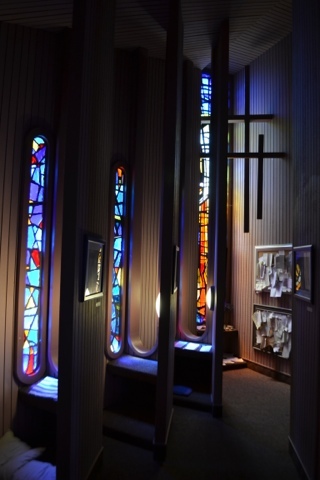 I also spent some time in the Prescott Chapel, a beautiful little prayer chapel that was originally built on the Pasadena campus, but made the trip to the Point Loma campus when they moved. I then spent some time in the library reading some Nease history. I'm kicking myself because I was within two blocks of a few family graves while in Pasadena, including supposedly that of William O. himself, but I did not visit them. 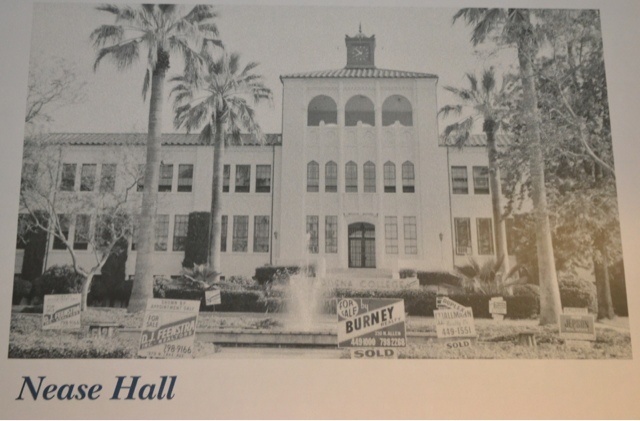 On Tuesday, I went back to the PLNU library and worked through parts of two history books on the school and looked at every page of some ten yearbooks that would include my great-grandfather (Floyd W. Nease) and his brother (Orval J. Nease I). 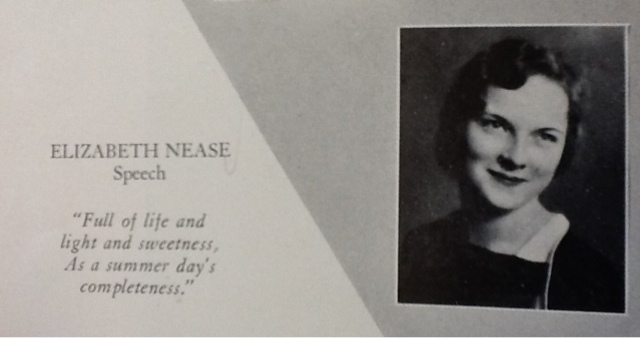 I also found pictures of their sister, Elizabeth Nease, who taught briefly at PNC, beginning when Orval was president. I am grateful for the help of the library archivist, Linda Hasper, in identifying and copying some resources. I found many pictures I had not seen and some pieces of writing I'd not read before. 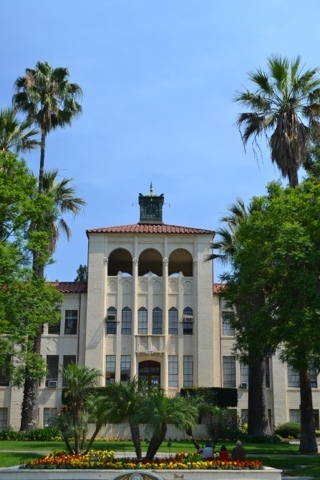 I found the parallel struggles and victories of Floyd and Orval who served in very similar situations, partially concurrently, as the very young presidents of struggling young Nazarene colleges, one on the West Coast (Orval - Pasadena Nazarene College, now Point Loma Nazarene University, 1928-1933) and the other on the East Coast (Floyd - Eastern Nazarene College, 1924-1930). One author noted their similar tactics. 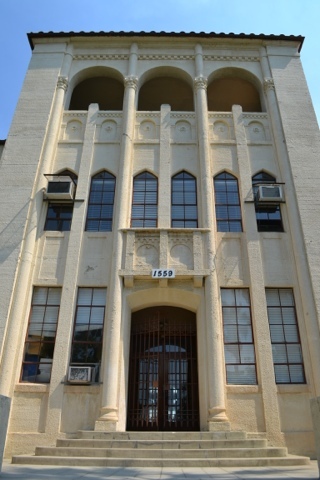 Both brothers built administration buildings as a way to increase excitement amongst the college communities. It was a struggle for both. But both persisted and succeeded in the building projects, though not without considerable adversity and financial struggles, coming in the heat and wake of the Great Depression. Today, what was Fowler Memorial (?) 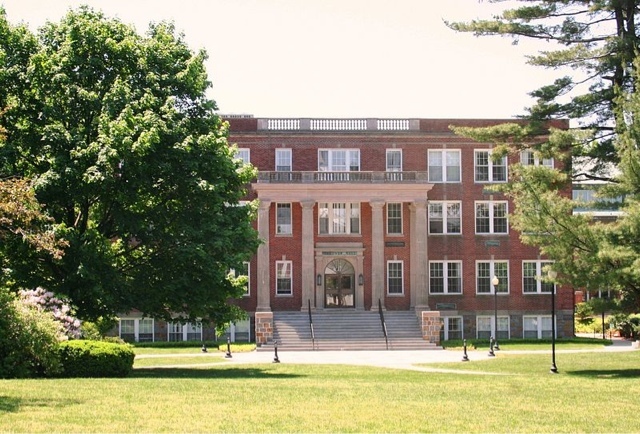 on ENC's campus still stands, though with decades of renovations and a more commonly-known name: Gardner Hall. 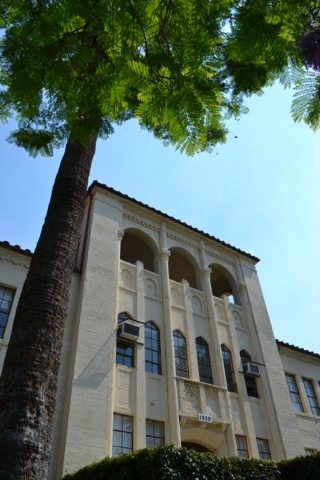 The Nease Hall (previously Bresee Memorial Building) is also still standing in Pasadena, CA, but on the old campus of Pasadena Nazarene College, which was sold in 1973. A number of schools and ministries use that campus now, including William Carey International and Providence Christian College. 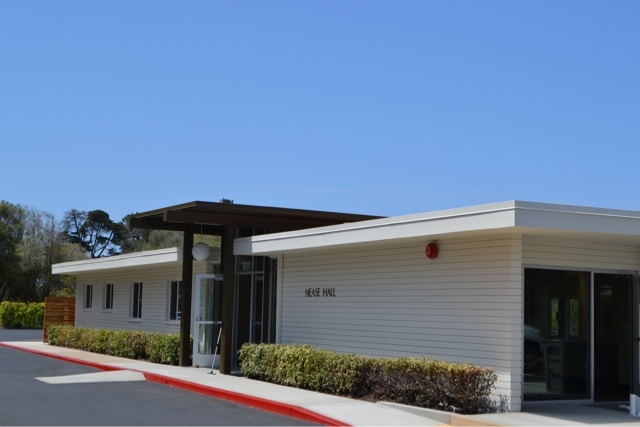 What was Nease Hall (PNC-->PLNU) today, now named for someone else. I read about him...but forgot the name. 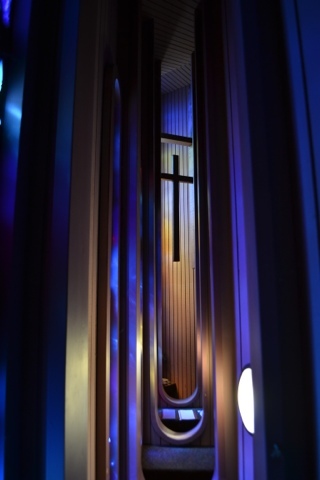 Nazarene higher education has surely changed, perhaps a world away from where they began, if not geographically, certainly in scope of mission and breadth of education. Reading about these two young men in their late 20s and early 30s leading these institutions is almost laughable in comparison to today's world of higher education. It's laughable not simply because of their age, but also the struggles that they went through and succeeded, which seem certainly impossible if to transpire today. Can anyone imagine a whole college faculty going two months without pay and still sticking around? ...or the salary of a president having to come via meals and food from the campus cafeteria for a period because they just didn't have the cash? ...or the debt of a college being partially held in check by the president himself getting together with but one other trustee to write off a note? ...or by mortgaging his own house to pay a portion of the college's debt? Crazy, foolish, young guys...how on earth did God ever do anything through them? 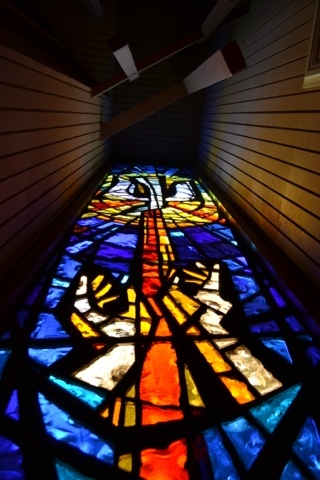 Today, my mother - Linda Nease Scott - serves as Associate Dean for ENC. Administration in the blood, you might say. I didn't know my great-grandfather, Floyd. There's no one alive who did as he died at the age of 37 while traveling for ENC, working hard raising money for the cash-strapped school. He died in Pittsburgh. My grandfather was five years old. I miss my grandfather, Stephen W. Nease. He died in 2006, but his person slowly began dying many years earlier. I have many great memories of the man: fishing, talking, traveling with him from church-to-church while he was out preaching. I remember the smell of their home (a variety of things, but mostly Old Spice). I would often visit them while he was president at ENC, spending the night in their house...in the town in which I now minister: Hingham, MA. Grandpa served four institutions as President: Mount Vernon Nazarene College (now University), Bethany Nazarene College (now Southern Nazarene University), Nazarene Theological Seminary, and finally, his and my alma mater, Eastern Nazarene College. The other day I was in one of the library worker's offices at PLNU asking about something or other. As she searched for it on the computer, I noticed a book in her small library: Grace in the Academic Community. I believe it is the only book in which my grandfather is published, having written but one small chapter. I suppose the Nazarene world is small enough, but in that moment, it was neat to find it on her shelf. I asked her if she'd read it. She hesitated, but said she had.